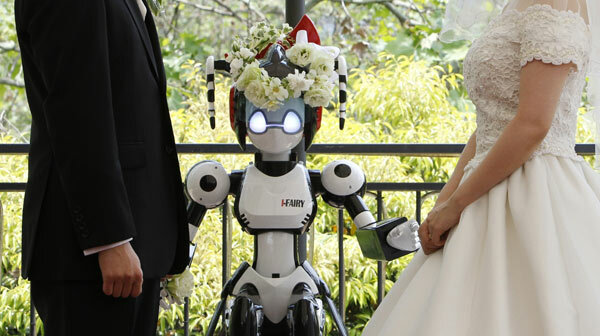 The groom looked dashing, his bride resplendent in white, but all eyes in this Japanese wedding were on the priest, a four-foot tall robot with colorful, flashing eyes called i-Fairy. I have to say that this is just plain weird.. first because Japan allowed the i-Fairy to officiate the wedding and secondly (and more importantly) that the couple wanted it to. As a person who has done a bit of premarital counseling I believe that marriage is something not to be taken likely. I do hope that this couple somehow found a way to involve people in their marital preparations.. and I do hope that they will not one day need an i-Fairy lawyer. I so agree with you Bob... Weddings are not games to be taken lightly...the most serious decision you make apart from salvation in relationships.